Find a Crew. Find a job. Keep flying. 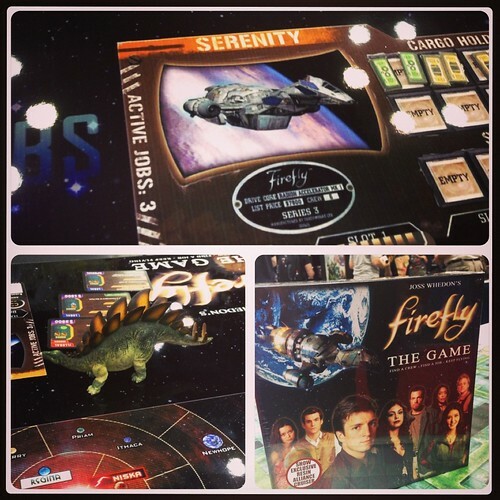 That's the premise behind Gale Force Nine's board game adaptation of the cult series Firefly (and it's movie Serenity). I was lucky enough to play test this at GenCon 2013, where I also picked up one of 1000 GenCon exclusive copies. This game flew off the shelf so fast there was literally a guy standing there with a wad of cash just accepting money as people pulled it off the pile they had set up. So far I've played two games. One with a group, and one solo. Yes, you can play this game alone which is part of its appeal for me. Here's what I think (and just what I think, so don't nerd rage on me! My first impression was that this game is absolutely beautiful. It's easily on the level of anything from Fantasy of Flight. In fact, when I spotted it Thursday morning I set my Canon to rapid-fire and went crazy taking pictures of the miniatures, cards, and beautiful board. 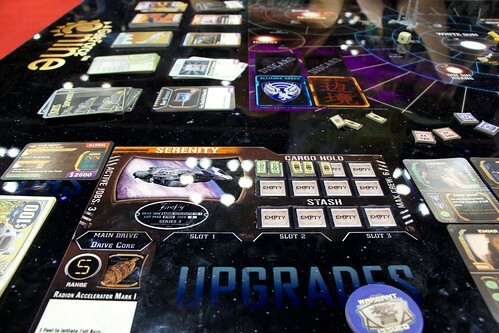 The set comes with four ship cards and their matching miniatures in solid colored plastic, a Reaver ship, and an Alliance ship. The ship cards are heavy weight cardboard and feel really great. There's really nothing flimsy or cheap about this game. Even the paper money feels and looks amazing. So what's the premise of the game? Well, like the box says you find a crew, find a job, and keep flying. Each player rolls to see who goes first. That person gets first dibs at ships but last choice on Leader (aka Captain). One thing I love is Serenity is no more powerful or special than the other ships. In fact, all of the ships are exactly the same. This prevents someone being really upset that they didn't get Serenity. One of the Leaders is Mal, but the other Leader options are just as good. They all have different abilities. When I play tested I got a random Leader, but when I played the other day I chose Mal. Honestly, I preferred the other guy. Once you all have a ship and Leader you get to decide the goal of the game. This is done by randomly choosing a Goal card, which outlines what you have to do to win. Another nice thing because you can't have one person that stacks their deck to win quickly. You don't know what you'll have to do until after you have a ship and Leader. Each turn is made up of four actions, of which you get to pick any two you want. Fly. Buy. Deal. Work. These sound exactly like they should. You can fly to a location (either one space at a turn, or spend a fuel to move extra), buy supplies if you're at an outpost, deal with people for work, or work your active jobs. Usually you'll always start by flying. This is done one of two ways. You can mozy, which means you move one space and you're done. Or, you can do a full burn. This requires you to spend a fuel and lets you move the full range of your ship. This is usually 5 spaces, but you can modify depending on your crew, upgrading your engine, or if you're playing the GenCon exclusive ship. The benefit to a full burn is you can get where you need to go faster. The downside is you have to stop at each space and draw a card. The card will usually say “Keep flying”, but you can also breakdown, encounter a derelict ship, or the worse attract the Alliance or Reaver ship. Buying is pretty basic. If you're at an outpost you can look through the discard pile or draw cards. You get to look at 3 and choose 2 to buy. You can also buy cargo, fuel, and parts, and this is where you'll buy crew. That's right, every crew has a hiring cost. You also have to pay this cost whenever you complete a mission, and if you don't they become disgruntled. So what? Well, that means they can jump ship, or another player can hire them right from under you! Having to hire crew also makes it really rare to have the Serenity and her entire crew on board. There are no bonuses if you did, though. That'd be cool. If you're at a location with one of the 5 business folk (like Badger or Niska) you can look for a job. This works the same as buying. Pull 3, keep 2. The only restriction is you can have 3 active jobs, and before you can make a job active you have to have the requirements listed on the card. There are two types of jobs, Legal and Illegal. Most illegal cards require you to Misbehave, which is a separate deck of cards you have to draw and fulfill before the job is complete. But, this is also how you get paid. The riskier the job, the greater the reward. Duh. The play time is pretty hefty, and goes up as you add players. For a solo game count on about an hour. For 3-4 players you'd better set aside 2-3 (4 if you're not familiar with the rules). 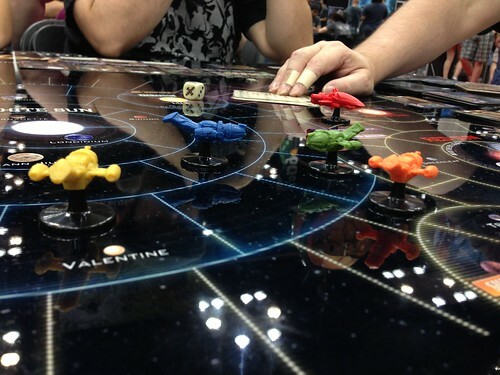 In addition, if you have the exclusive GenCon ship the Artful Dodger from Game Trade Magazine, you can have 5 players. This leads me to believe you could add a number of players as long as you have ship cards and tokens. Though the Artful Dodger is the only ship that is different (1 extra crew and movement space, 1 less cargo). The other thing to keep in mind is play area. This game requires a LOT of space to play. At least a 4 foot by 4 foot area. This is due to not only having a large game board, but also by the sheer amount of decks and discard piles. This is probably best played on a floor. There is one last, really cool aspect that I rarely saw used. The ability to Co-Op. This isn't really Co-Op like both winning the game. But if you're in the same sector you can trade supplies and cargo. This is a neat aspect that could really turn the game if used correctly. As a Firefly fan I'd rate this game an 8/10, mainly due to the hefty learning curve. 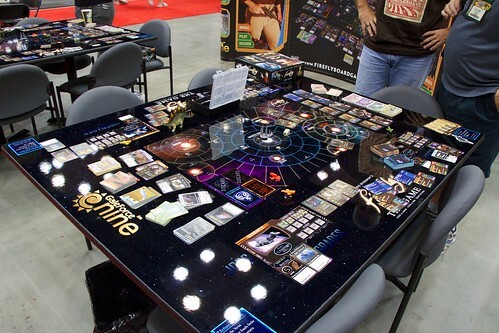 If I hadn't demoed it at GenCon I would never know how to play. For non-Firefly fans, I can really only give this a 5/10. It really does rely on your knowledge of the 'verse and love of the series. Without that, I doubt it would hold your attention for more than a few rounds.